Bridges to Prosperity is an organization that provides isolated communities with access to essential healthcare, education, and economic opportunities by building footbridges over impassible rivers. After working with the organization Bridges to Prosperity in El Salvador during Summer 2011, DEID and Bridges to Prosperity partnered again to design and construct a pedestrian bridge in rural Bolivia. Pedestrian bridges have a high impact in communities they are built in because many rural communities do not have access to vehicular roads, so they must physically cross rivers to access the other side. These rivers are often impassible during the rainy season, and community members cannot cross the rivers will resort to unsafe methods in order to reach the other side. Since our bridge was be built with the community members, it provided them with a technical education that can be applied to other aspects of their lives. 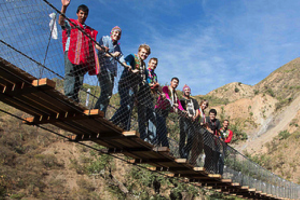 Building the bridge also provided a technical, cultural, and language education for the students involved in the design process and in the construction process.